Another night where network TV couldn’t muster more than a 1.0 rating. Ratings analysis follows the chart. CBS: After UNDERCOVER BOSS gained 0.2 to 0.9, the season finale of HAWAII 5-0 was up 0.1 to 1.0, enough to win the night. 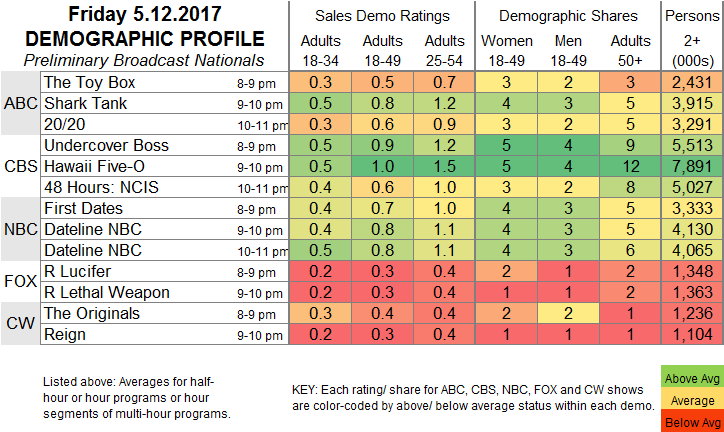 48 HOURS: NCIS followed at 0.6. ABC: THE TOY BOX dropped 0.1 to 0.5, and the season finale of SHARK TANK fell 0.2 to 0.8. 20/20 wrapped up the weak night down 0.3 to 0.6. NBC: FIRST DATES (0.7) and DATELINE (0.8) were steady. CW: THE ORIGINALS (0.4) and REIGN (0.3) each rose 0.1. An NHL PLAYOFFS game is the highlight of Saturday primetime, and SATURDAY NIGHT LIVE (primetime on the west coast) features Melissa McCarthy as host, with musical guest HAIM. Sunday features 2-hour finales for ABC’s ONCE UPON A TIME and Showtime’s GUERRILLA; in addition, FOX airs the MISS USA pageant. CABLE RATINGS: Come back Monday for detailed demographic ratings for top cable programs from this day.